Looks like a great offer to me and I've been looking around for a while. Amazing price for i5 it is the 4gb ram model though but it's still great for the price. Bear in mind it doesn't include the keyboard/type cover. Good price! TCB is also showing 5% on Surface purchases at the moment I believe? Much cheaper than what I paid in the Summer for the same model, if you want the accidental damage etc insurance I found it cheaper to buy from John Lewis who might price match if it's this price at Currys. I got this when it was 699 to replace iPad Air 2 and found this to be much better for what I use it for. I couldn't get JL to price match because theirs comes with a pen, or did. Hope you have more luck than me. That's for a surface book, this is the surface pro. Dont you mean 699? Currys were doing it for 699 with the cover (no pen) They knocked 10%on christmas eve, still no pen.I dont remember it ever been 599!!!! That was for a Surface Book, not a Surface Pro, different device so not valid. Dont you mean 699? Currys were doing it for 699 with the cover (no pen) … Dont you mean 699? Currys were doing it for 699 with the cover (no pen) They knocked 10%on christmas eve, still no pen.I dont remember it ever been 599!!!! Might have been for the m3 version perhaps - I got the m3/pen/keyboard for £599. Lovely little machine. Yes, I could read reviews but I'd rather have unbiased opinions from people who paid for it with their own money, and aren't worried about loss of advertising revenue. Additionally I'm mostly concerned with pen accuracy / lag than loading times etc. ​ive decided i need the sp5 in my life. i think it's time and it needs to be in my life but it better not have leftover components from last like gen6 cpu or 980 gpu. I bought this yesterday at a higher price and got John Lewis to price match this and bought the keyboard from John Lewis as well. 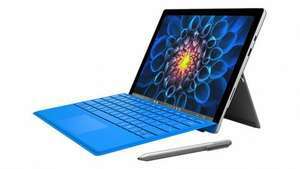 So £659.00 for the surface pro 4 and £80.00 for the keyboard. Deal posting newbie! This is joelpunterfamily first deal post. Help out by leaving a posting tip or just to show your appreciation for their contribution.